Anti acne treatment creams manufacturing, organic Italian anti-acne cosmetics and VIP creams made in Italy. Italian acne treatment cosmetics collection to support worldwide health care cosmetics distributors at manufacturing pricing. Anti acne treatment suitable for oily skin with acne-prone skin: keratolytic action, anticomedogena for the elimination of the keratin plug and consequent liberation of the pilosebaceous duct; antimicrobial and antifungal on the main species of bacteria and dermatophyte, sebum-regulating with significant reduction of seborrhea, skin smoothing action. 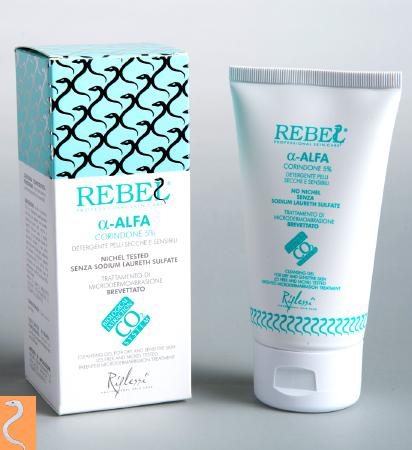 REBEL SEBO CHECK CREAM is the first cream specially designed to ensure a normalizing treatment to oily, impure ( with pores ) and those mixed skin (with seborrheic areas in dry zones and alternate alipiche). Thanks to its innovative formula does not dry the skin but helps to define and maintain the proper moisture balance: inhibiting the production of sebum in the zones and stimulating fat in dry ones. 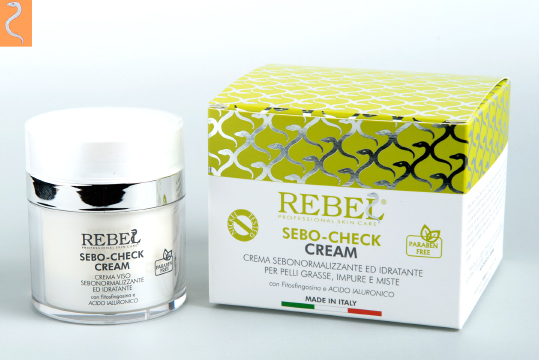 Rebel Sebo Check Cream visibly reduces the diameter of the pores and shine, leaving the skin soft, smooth, smooth and firm. OILY SKIN , AND MIXED IMPURE : THE PERFECT BALANCE BETWEEN SEBO AND MOISTURE. with Phytosphingosine, hyaluronic acid, glutamic acid, oleanolic acid and Diidroguaiaretico, Methionine, Cystine, Vitamin B6 and H. Nickel Tested, No Parabens, No paraffin or Petrolati, Not Tested on Animals. 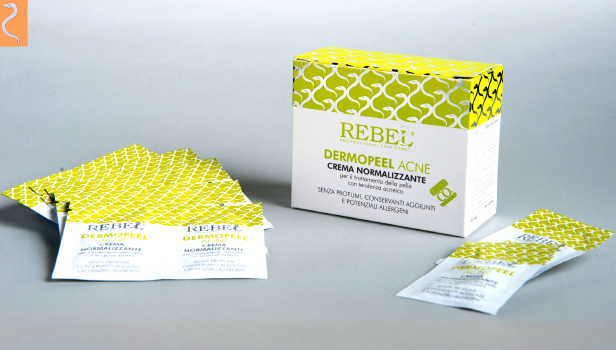 REBEL DERMOPEEL ACNE is a cosmetic preparation pluri- effective, suitable for oily skin with acne skin: keratolytic action, anticomedogena for the elimination of the keratin plug then liberation of the pilosebaceous duct, antimicrobial and antifungal on main bacteria and dermatophyte fungi; sebum- regulating with significant reduction of seborrhea, skin smoothing action. The Dermo- Cleansing for Skin Acne is a cosmetic aid specially formulated for proper cleansing of the skin with acne, oily and impure. Acne is a very common dermatosis that affects the sebaceous gland. Necessary condition for the occurrence of the phenomenon acneico is an imbalance in the level of androgen hormones, which causes an increased production of sebum by the gland. The excess sebum and keratin derivatives, accumulate and form a closed comedo (white dot) or open comedo (blackhead ). The formation of inflammatory manifestations such as "papules" and "pustules", is due to the presence of skin bacteria that cause infection and inflammation of hair follicles and sebaceous glands. The Dermo- Cleansing for Skin Acne is a cosmetic adjuvant useful for treating this condition. Its formulation LES Free (without Sodium Laureth Sulfate) minimizes the risk of irritation phenomena related to the alteration of the natural hydro-lipid balance of the skin. is a fluid exfoliating facial aging based on micronized powder of ruby (corundum crystals), which smoothes the skin evenly in a completely natural way. Corundum range improves cell turnover through stimulation of the natural process of tissue repair, restores the skin radiance, visibly reduces wrinkles, evens out the complexion, improves skin firmness and hydration. THE EXFOLIATION ACTION of Gamma Corundum active mechanisms for the production of Collagen, Elastin and Hyaluronic Acid: Key elements of support, elasticity and firmness of the skin. Already after the first use of aluminum oxide 12% to 25% range , points blacks and accumulation of sebum are brought to the surface and the surface lighten dark spots, wrinkles and small scars become less noticeable. Following a few treatments with Gamma aluminum oxide, histological studies have shown an increase in the thickness of the upper layers of the epidermis and the dermis.